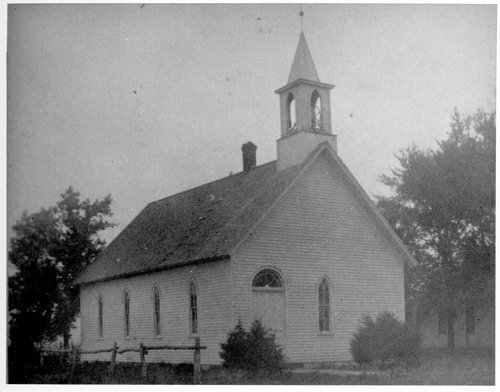 This black and white photograph shows the United Brethren Church in Richland, Kansas. Built in 1888 on the east side of town on Board Street, the church closed it's doors on May 28, 1967. In the late 1960s and early 1970s the town of Richland, located in the Monmouth Township in the southeast corner of Shawnee County along the Wakarusa River, was abandon when the Corps of Engineers acquired land in the area for the flood plain of Clinton Lake in nearby Douglas County. Today, the broken pavement that once covered the streets is the only remnant of the town.